An orchestral painter of thoughts, ideas and visions, Newsom’s harp-fueled allusions, Chaucer charm and roots-strewn chutzpah spin pixilated poetry over sea-side symphonies. Presenting chamber-folk ensembles inside harbor-town dives while medieval vaudevillians march across rainbow-combed heather, “Divers,” wisely migrates from historical pastorals to metaphorical fantasies conjuring fleeting suites inside sly two-sided lullabies. 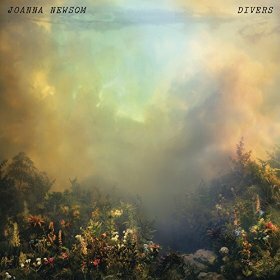 Five years since her last undertaking, the composer collaborated with several distinct arrangers for a fourth album graced with inquisitive richness and intricate consistency whose puzzle-box pleasantries rouse and rejoice; dainty, saintly cadence stirring tall tales from mythic elixirs bottled in deep thoughts and swimming in exquisite symmetries buried in quizzical bliss. A renaissance sorceress and shape-shifting traditionalist, Ms Newsom plays Madison’s Orpheum Theater December 18th with tentative sensualists Alela Diane and Ryan Francesconi.